LONG BEACH (Pope Diva I) -- After the recent departure of several AeroCultists from sonymusic.com's Aerosmith Bulletin Board, remaining cult members consider the meaning of unexplained paranormal phenomena. The "AeroCult," a group of music fans whose adherents believe that members of the popular musical act Aerosmith (America's Greatest Rock and Roll Band) are gods, comprise a subsect of American society that is not always embraced by the wider culture. The AeroCult, like the cosanostra, is reportedly a very hard group to leave, as few AeroCultists ever leave the cult, and among those who do, even fewer stay away for any substantial period of time. 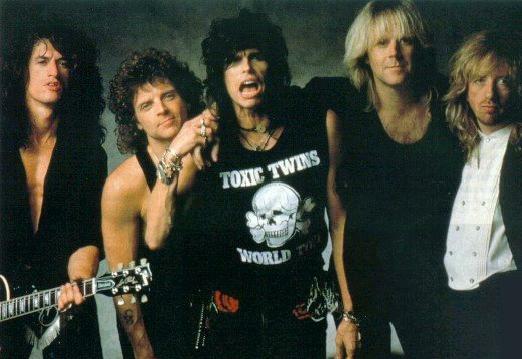 A recent rash of defections from sonymusic.com's Aerosmith Bulletin Board on the World Wide Web (a gathering place for fellowship among AreoCult members) has caused dissention in the ranks of the AeroCult. Bickering, in-fighting, back-biting, and general crankiness -- which some believe to be related to either the unseasonably hot weather of late, and many others believe to be caused by widespread paranoia over receiving concert tickets "in time" -- have taken their toll on the close-knit group of worshippers. Early Tuesday morning, however, members of the group began to report strange occurrences related to the band. Claiming that this cloud formation was "a sign," dreamin'ragdoll went on to explain that the deities must be sending a message to the flock, and that the "Miracle of the Clouds" is intended to bring those who have fallen away back into the fold. In a matter of minutes, an AeroCultists in Manhattan, who calls himself "licknapromise" claimed to have spotted a series of five diamonds atop a skyscraper nearby. The gems, perched atop the skyscraper from its east to west corners, were reportedly configured in a manner reminiscent of cover art on the album "Rocks," released by Aerosmith in 1976 and considered by many to be one of the groups finest efforts. licknapromise, who claims to be able to "speak in tongues," insists that this is a message from the deities, which he translates to be, "Look at all we have given you! Put aside your petty differences and worship in a manner pleasing to us!" Shortly thereafter, an AeroCultist in Long Beach, California calling herself "Pope Diva I" claimed that the band itself appeared to her in a vision on the ceiling over her bed. Pope Diva I claims that the image of the band appeared suddenly, and that she was filled with the band members'... divine spirit. The vision, she insists, lasted through the night, and left her with the certainty that the band members are, indeed, gods, and that their visitation was intended to bring all AeroCultists back into the bosom of the band, and back to sonymusic.com's Aerosmith Bulletin Board, for joyous worship. We are unable to confirm whether or not these alleged paranormal events have resulted in the return of any of the AeroCult defectors. WASHINGTON DC (Pope Diva I) -- We have unconfirmed reports from unnamed AeroCultists in the nation's capitol that the recently refurbished Washington Monument appears to be draped in a series of long pieces of gauzy fabric, which are said to be "snapping smartly in the breeze on this windy evening." The as-yet-unidentified AeroCultists claim that these are actually scarves, identical to those regularly tied to the mic stand of one of their gods, Steven Tyler of the musical act Aerosmith (America's Greatest Rock and Roll Band), when the group is performing live. We are unable to confirm whether or not these are, indeed, the same scarves Mr. Tyler is purported to use (just on a much grander scale), although we can confirm that there is a massive traffic jam on DuPont Circle, possibly caused by gawkers, or by individuals abandoning their autos to run to the monument, site of this latest paranormal event. We have no information as to whether or not authorities intend to leave the scarves undisturbed during tomorrow's Independence Day Ceremonies, if these reports prove to be accurate.